Google has just updated its YouTube apps for both iOS and Android which, among other things, brings video suggestion overlays helping you find what to watch next. Details, as well as those all-important download links can be found right after the jump! Of course, these video overlay suggestions are a slippery slope for all you procrastinators out there. You find one video of interest, and before you know it, these ‘helpful’ suggestions have pushed you in the direction of a sneezing panda, a child biting his brother’s finger, or perhaps even a plump Korean man singing incredibly catchy pop. I hope you’re getting all the references here. 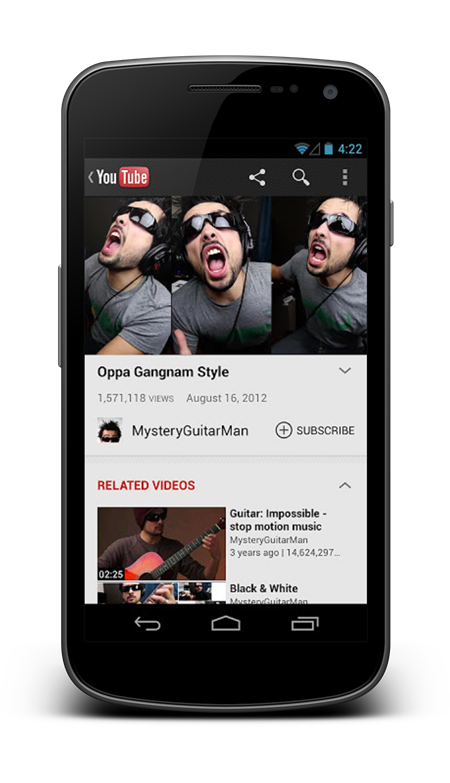 As well as the video suggestions, which are ideal for the general consumer, YouTube creators and partners also have some useful new features bundled into the latest version that the app. So-called InVideo Programming allows uploaders to promote their videos and improve brand awareness from by getting viewers to play the next clip on their channel. It has been available through the desktop version for a good while now, having been utilized by more than one million channel owners since it debuted in October, and it’s good to see the mobile world now getting a taster of this new implementation. The video overlay suggestions haven’t yet made their way to the mobile site, so you will have to be running the official app for iOS or Android in order to test it out. With that said, the feature will be coming to the mobile version very soon, if you want to keep your installed app count down to a minimum, you can hold out for Google’s usually prompt update. The new version of YouTube is now available over at the iOS App Store and Google Play Store, and although we’d expect most, if not all of you already have the official app installed on your device, you can grab it via the direct links provided below.